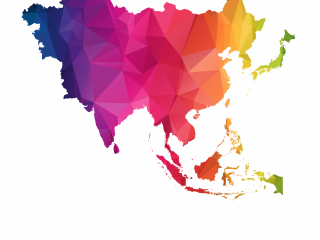 Bank Indonesia, Bangko Central ng Pilipinas, and the Bank of Thailand hold their monetary policy meetings next week. We expect all three to leave policy unchanged. A moderation in GDP growth and subdued inflation (aside from the Philippines) is partially responsible for this. But more importantly, an ongoing consolidation in their respective currencies after significant losses earlier in the year is a big solace for BI and BSP, Asia's busiest central banks, in their drive to rein in currency weakness. The Philippine peso (PHP) was the region's best performer in October and continues to add to those gains in November with a 1.8% month-to-date (MTD) appreciation against the US dollar. This month, the best performing currency is the Indonesian rupiah (IDR), with a 4.4% of gain so far, recovering more than a third of the cumulative loss in the first 10 months of the year. The Thai baht (THB), which, in a sudden reversal of fortune, was Asia’s worst currency in October, has also joined in the rally this month. Lower oil prices are also helping to keep policy unchanged and, absent some adverse shock on the horizon, Asia’s hitherto hard-hit currencies are set to perform well. This week, Indonesia and the Philippines reported steady GDP growth for the third quarter, at 5.2% and 6.1%, respectively. However, a softening of household spending- the key GDP driver in both countries- was alarming, particularly in the Philippines where inflation of 6.7% in October has already been hurting consumers. Until the Philippines GDP release, our house view had been for a 25 basis point BSP rate hike at the meeting next week. That's now been revised to no change, probably through the rest of the year (read more here). The same looks to be the case for BI policy, as a strong performance for the Indonesian rupiah and stable inflation around 3% allow for stable policy, for now. Shifting between talk of continued accommodation and tightening (or normalisation), the BoT policymakers have missed the boat this year. Recent economic data undermines the government’s optimism on GDP growth this year – we have cut our 3Q forecast to 3.7% from 4.1% (read more here). This dampens the prospects for policy normalisation; it’s hard to call it tightening, which isn’t required just yet with continued low inflation and prevailing growth risks. China’s exports rose 21% year-on-year in October even though tariffs on $250 billion of exports to the US went into full effect at the end of September. Some of this strength could be attributed to the front-loading of shipments before the tariffs rate on $200 billion of exports rises from 10% to 25% at the beginning of 2019 (read more here). The government is also taking action to soften the impact of the trade dispute with fiscal stimulus. China’s remaining October data on industrial production, fixed asset investment, retail sales, and home prices will be viewed in light of this fiscal stimulus. Any upside surprises from this data will reinforce that the stimulus is kicking in. We believe that macro policy in China is geared towards a soft-landing, which is a key positive for the rest of Asia, and probably the global economy. 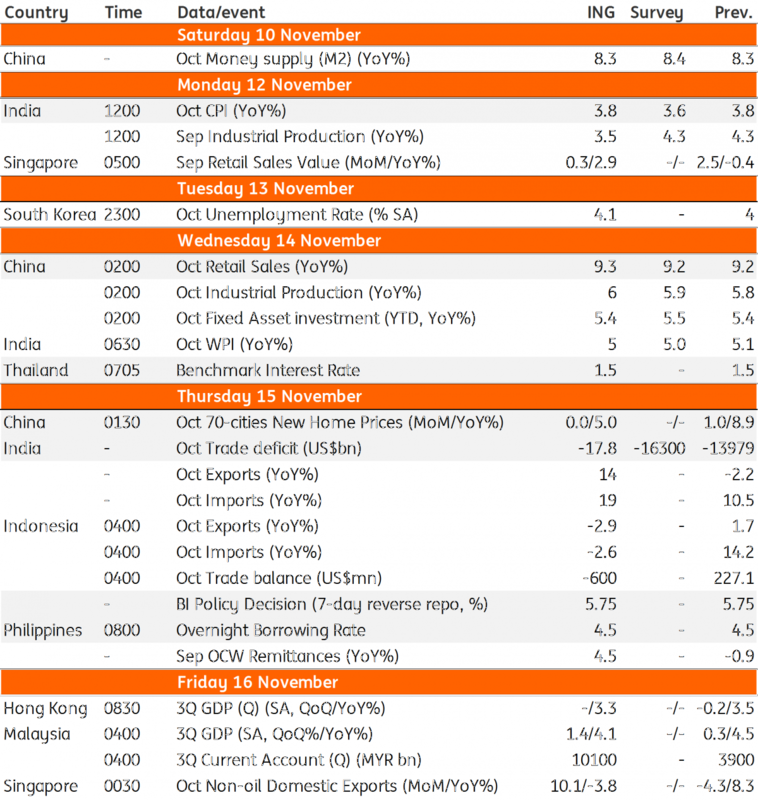 A slew of economic data from India on inflation, trade, and industrial production will add to the local market volatility after a holiday-related respite this week. Inflation data matters the most for the central bank's (RBI) policy. The RBI resisted pressure to support the currency (INR) during stormy periods of emerging market contagion earlier in the year, and again in October when a row between the RBI and government (over the issue of boosting banking liquidity and lending growth ahead of elections) intensified. The RBI's rationale for keeping policy stable has been well-behaved consumer price inflation, within the 2-6% policy target, and increased downside growth risks. We don’t expect the data next week to depart from the recent trend of stable inflation around 4%. The good news here is a conditional waiver from the US sanctions on oil imports from Iran for six months. With lower oil prices offsetting administrative measures (a hike in minimum support prices for farm products and higher civil servant salaries) inflation should remain in the middle of the RBI’s target range through the end of the current financial year in March 2019. However, with tight liquidity depressing investment and the drag from net exports continuing to widen, GDP growth is poised to slow. Such a growth-inflation dynamic suggests the RBI will keep policy unchanged at the next meeting in December. For now, calm has returned. A truce between the RBI and the government together with lower oil prices and a softer US dollar have put some life back in Asia's most-stressed currency this year. With a 1.3% month-to-date appreciation, November looks to be shaping up as the best month for the INR since March 2017.